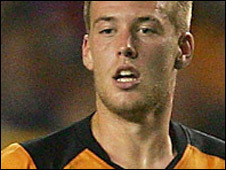 Blackpool have made their 12th summer signing with Wolves defender Rob Edwards joining on a two-year contract for an undisclosed fee. The Wales international centre-back, 25, is expected to fill the void left by Kaspars Gorkss who joined QPR. Edwards told BBC Radio Lancashire: "I want to play and improve and help the squad to better last year's success. "I've had good seasons before at Wolves and want that again rather than being on the bench." Edwards, who started his career at Aston Villa, insisted he would be ready if asked to play against Bristol City on the opening day of the new season. "I've had a really good pre-season with Wolves and feel really fit and strong and raring to go - it's just that match sharpness now which you can only get through playing games," added Edwards.